No matter what country Gabriel Knight goes to, it seems he must deal with the past. For those of you who haven't played the previous games in this series, Gabriel is a Schattenjäger, someone who deals with mysteries involving the supernatural. (The manual for Gabriel Knight 3 describes his job as a "kind-of modern-day Inquisitor," though I don't know if that's meant to be a compliment.) We were introduced to Gabriel in Gabriel Knight: Sins of the Father , a murder mystery that is set in New Orleans. Gabriel was reared by his grandmother and had little knowledge of his father or his family, so he was surprised to find that his German great-uncle was passing the mantle of Schattenjäger to him. All of this occurred while Gabriel, with the help of his reluctant assistant Grace Nakimura, was dealing with a series of murders that involved voodoo. In the second game, Gabriel and Grace travelled to Germany and had to deal with a rash of murders, mutilations, and werewolves. Fans of the series have been waiting for the third game for years. 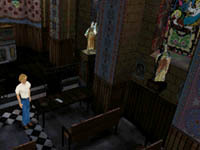 Gabriel Knight 3 was originally slated to be released in 1998; in fact, the comic book included with the game was copyrighted in 1998, and e-mails in the game are dated similarly. But the 1998 release date slipped to early 1999, then mid-1999. GK3 was finally released in November of 1999, to much excitement. It was one of the few adventures released that year by a big-name company, and expectations were high. Fans wondered if GK3 would live up to its hype. To some extent it does. GK3 is a solid adventure, and one of the best mysteries I've ever played. But there are a number of seemingly-unpolished parts of the game, and the game's major innovation, that it takes place in a real-time-rendered 3D world, has been well-explored by games in other genres. The backstory to GK3 is told in the form of a comic book included in the box. In it, Gabriel and Grace are invited to spend a weekend with James Stewart, current heir-in-exile to the Scottish throne. It turns out that James's family has been plagued by episodes in which they awake in the morning tired and pale, with bite marks on their necks. James explains that these are caused by "night visitors," and not the same ones who visited Amahl. James needs a Schattenjäger to protect his infant son. Gabriel accepts. That night, while standing guard over the baby, he sees one of the night visitors steal the baby and escape in a car driven by two men. He follows the car to a train station and boards the train. He finds the men and a trunk full of air holes, only to be knocked unconsious. Gabriel wakes up when the train reaches the town of Rennes-le-Château. What follows is a mystery as complex and convoluted as any I've read, one which is based in part on historical events. Jane Jensen, the designer, has written a story which involves a tour group, the Knights Templar, the holy grail, the real town of Rennes-le-Château, the Freemasons, a royal bloodline, and enough characters and red herrings to keep you hopping for a while. While the plot's complexity is good in that it gives you a real mystery to sink your teeth into, it quickly becomes hard to keep up with what was going on. The game is broken into timeblocks, a design element I first saw in Gareth Rees's excellent text adventure Christminster . Each timeblock covers a few hours of game time, and you won't progress to the next timeblock until you've completed certain required tasks. This allows time to pass without forcing you to scramble to keep up. During a timeblock, nothing crucial will change without you noticing; if characters move around in the middle of the timeblock, you hear a ticking clock to let you know they've moved. I like this method of advancing time, since I tend to get anxious if I know the adventure is rushing past me. Another interesting design decision that Jensen and her team made was to make many of the sub-plots optional. If you do only the required tasks to progress through the timeblocks, you'll finish the game quickly but end up with a score that's well below the maximum number of points. To get all the points, you must follow up every plot thread that comes your way. These threads are clued in various ways, from sounds you hear that are unrelated to what you're doing to events which you can see taking place in the background. It's conceivable that you could follow up on all the plot threads the first time through, but in practice you're unlikely to do so. To get the maximum points you must play and replay timeblocks, looking for things you've missed. Normally this style of replay is required when you play a mystery, but GK3 lets you skip ahead if you don't like going over the same ground repeatedly, looking for more clues. However, I recommend that you do replay timeblocks. GK3 really lets you play detective. You have to take fingerprints, record license plate numbers, eavesdrop on conversations, and in general act like a sleuth, but you'll miss out on a lot of these actions if you stick to the main storyline. Since you're allowed to miss certain sub-plots, the game can clue these plots very subtly without penalizing you. You end up feeling extremely clever for uncovering these sub-plots because the game hasn't had to shove clues under your nose. The game's graphics are only so-so. Some environments, like the church in Rennes-le-Château, are well-done. Others are not so good: the outdoor scenes are decorated with spindly stick trees and odd textures for the ground. Characters are not as blocky as in System Shock 2 , but they're no paragons of beauty, either. A lot of attention was paid to making their faces very expressive; indeed, a game like GK3 lives or dies by how real its characters seem, and good facial expressions help establish those characters. It's a pity that the characters' bodies are so blocky, with pasty, one-color arms and hands like blobs of Silly Putty -- a fact that makes one puzzle, in which you must recognize a handshake and later reproduce it, harder than it should be. And for some reason, no one ever stands with their hands in their pockets.